Now that you have defined your goals, it is time to create a Plan of Action. The Plan of Action is necessary because it is one of the best ways to see how certain actions contribute to the end result: to be happy. The Plan of Action also helps differentiate between the goals that need to be accomplished first, and the ones that can result from the previous achievements. One of the best ways that I have found to create a Plan of Action is through a hierarchy map. In order to create this map, you will be using the timeline you created in Discovering Your Goals as a guideline. The most effective way for me to demonstrate this is by providing an example. Below is my hierarchy map. As you can see by looking at the hierarchical map, you will notice that career is always included in the first three phases because the career is a source of income. Maintaining a comfortable income does help when it comes to contributing to happiness. The best way to understand the map is by viewing it in the following procedure, which starts at the bottom of the map. 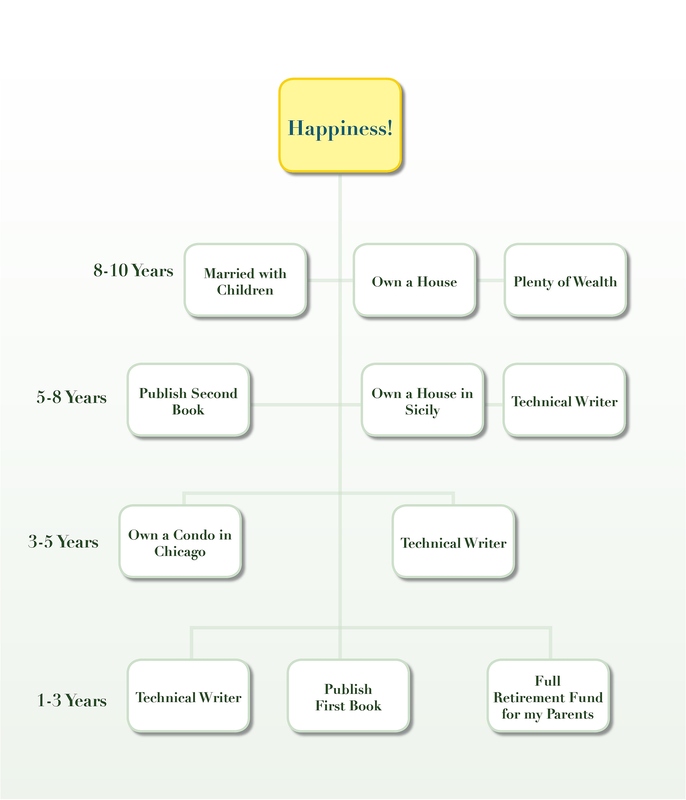 In order for me to be happy, I must maintain my Technical Writing job and publish my first book so that I can provide for my parents and they can finally retire. After I pay for their retirement, I can purchase a condo in the city while still being a Technical Writer. While still a Technical Writer, I can publish my second book and, when it is successful, purchase a house in Salemi, Sicily. After I purchase my house in Sicily, I would like to be married with children, own a house in the states where I can raise my children, and maintain my wealth from the previous jobs and book sales. The best way to create a Plan of Action is by positioning the goals that must be accomplished first before the others are possible. For instance, it would be helpful for me to publish my first book so that my parents can retire because I cannot provide their retirement fund on my salary alone. Also, the revenue from a published book that is successful would help me purchase a condo, and a second published book would help me acquire the home in Sicily. Now it is important to remember that other goals such as visiting a new place or experiencing the Running of the Bulls in Spain will be the added bonuses of traveling down your path. Therefore, these goals could be considered life experiences and do not necessarily need to be in the Plan of Action, but more so in a bucket list. Bucket lists are fun and everyone should have one. Plus, crossing out something on the bucket list feels phenomenal. Give it a try. I bet you will love it! But back to the main purpose, the Plan of Action will help you understand what you need to do in order to achieve the final goal, happiness. Once again, these phases may not last one to three years, but quite possibly one to two years. Maybe the first phase could be completed in eight months. It all depends on how dedicated you are to your Plan of Action. Hopefully this idea of a Plan of Action helps guide you down your own path. I found it to work wonderfully because it helps me remember the goals and when I would like to achieve them. It also helps me stay on track. I sure hope that it can do the same for you. On Saturday, I will discuss the dramatic difference between using the terms if and when, and how using one over the other can truly change your life and mindset. Hope to see you then. Very cool pictorial and very helpful. I may use this. Thanks. Thank you so much! I hope it helps. Giving thanks are the concrete steps to happiness.